You can find here the new design of Ten Peso coin of the Philippines. Bangko Sentral ng Pilipinas released Tuesday the 10 million pieces of the commemorative coin in honor of hero Andres Bonifacio's 150th birth anniversary last November 30. 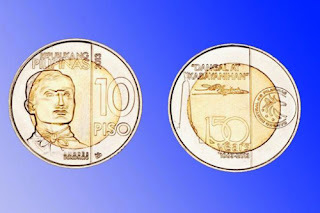 BSP said, "The new P10 commemorative coin features Bonifacio's image on one side along with the markings '150 years', 'Republika ng Pilipinas' and '2013'." As you can see from the image above, the Bonifacio's signature, Bonifacio monument, the markings of '150 years', 1863-2013 and 'Dangal at Bayanihan' are the new features of P10 coin. According to ABS-CBNNews.com, the issuance of the new P10 coin was recommended by the Monetary Board and approved by the Office of the President. For the meantime, please bookmark this page now or visit this site more often for you to be updated. You may also share this post to your friends so they may know about the new Ten Peso Coin. Comments or suggestions about "New Ten Peso Coin Released by Bangko Sentral ng Pilipinas" is important to us, you may share it by using the comment box below.